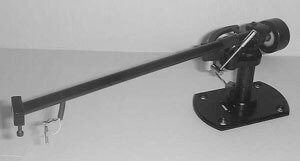 The original Mission 774 tonearm was designed by John Bicht and incorporated fluid damping and a detachable alloy arm wand. The arm is designed to direct couple the cartridge assembly to the turntable mass. This is essential in that if the tonearm suffers free play, it will inevitably set itself in motion independent of record modulations thereby adding to and subtracting from information retrieved by the stylus tip. The secret of the Mission 774 is its unique rigid bearing design, elimination of conventional 'flapping' headshell and other resonating parts, total structural integrity, low effective mass and minimal pivot friction. The arm employs silicone viscous damping and three different damping paddles are supplied with the 774 to optimize the performance of different cartridges of varying compliance. Mission 774 (original) owners manual, service manuals and schematics are for reference only and the Vinyl Engine bears no responsibility for errors or other inaccuracies. The PDF files are provided under strict licence. Reproduction without prior permission or for financial gain is strictly prohibited. This website is not affiliated with or sponsored by Mission. Posted Mon, 04/25/2011 - 18:40 by ofmr1.